Thank you very much. 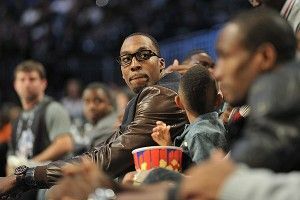 Everybody is on pins and needles across the country, particularly those teams who are in the running for Dwight Howard. Are you ready to go, Dwight? Where is the Superman outfit? It’s at the dry cleaner’s. I got grape jelly on the cape. What have you thought about this process? I have thought lots of things actually, but the most important thing is that whatever I thought, whatever I think, I share it. It’s important to me that I make things as confusing and aggravating as possible for the Orlando fan base. You weren’t able to be recruited because you went straight to the NBA from high school. Have you enjoyed this recruiting process now? Oh, it’s been awesome. But don’t underestimate my ability to upset the collegiate athletics apple cart. Sometimes I will just call random college basketball coaches and let them know I’m available, too. Just the other day I called Eddie Sutton at 5 in the morning. Eddie Sutton hasn’t coached in years. How many people know your indecision right now? One hand or two hands? Let’s go with a baker’s dozen. That’s my favorite number. When did you not decide? I didn’t decide this morning. I got up, called Chip Kelly and told him I was on the verge of becoming a Duck, quacked really loudly, hung up, then made a peanut butter and jelly sandwich. Then I got jelly on my cape. Had to go put on my other cape. Then I checked my voice mail and Stan Van left me a message that was just the sound of his facial hair growing. Then the day just got away from me. So the last time you changed your mind was yesterday? Today? So does the team that you’re going to, that you’ll announce in a few minutes, do they know your indecision? Are they aware you still don’t know what you want to do? No, that would take the fun out of it. Do you have any doubts about your indecision? I feel like at this point indecisiveness is a key building block to my brand. that you are not making? It’s like I said, “This moment is what matters.” At this moment, I want to watch Finding Nemo. Primarily, Jim, the key for me is not being cold. But Orlando already belongs to Mickey. I need an unclaimed, open territory to build up my own Magic Kingdom. I can no longer live in The Mouse’s shadow. What do you think of when you think of Orlando? Boom. Space Mountain. What do you think of when you think of Brooklyn? Notorious B.I.G., cheesecake, and old-timey artisanal cocktails. I can work with that. I can take that over. Besides, the weather doesn’t bother me. I’m more worried about the construction workers who will be building my bio-dome. In the end, I care about other people. Are You Tournament Challenge Challenged?